The flashy blooms of yellow flag iris (Iris pseudacorus) rim Lost Lagoon and Beaver Lake at this time of year…but not this year. Our Special Invasive Removal Team has been hard at work removing the flowers to prevent the dispersal of the plants’ buoyant seeds. This invasive plant chokes out native wetland species like catails, sedges and rushes, reducing habitat for native wildlife and impacting biodiversity. Our next EcoStewards events are on July 14, July 28, August 11 and August 25. Stanley Park Ecology Society is able to support the amazing efforts of our volunteers through invaluable funding provided by the TD Friends of the Environment Foundation (TD FEF). With their continued generosity, we are able to keep muddy gloves and vests clean, sharpen tools, and provide our volunteers with some tasty treats! Many thanks to TD FEF for their November 2017 contribution of $8,750 to support our efforts to manage invasive plant species. 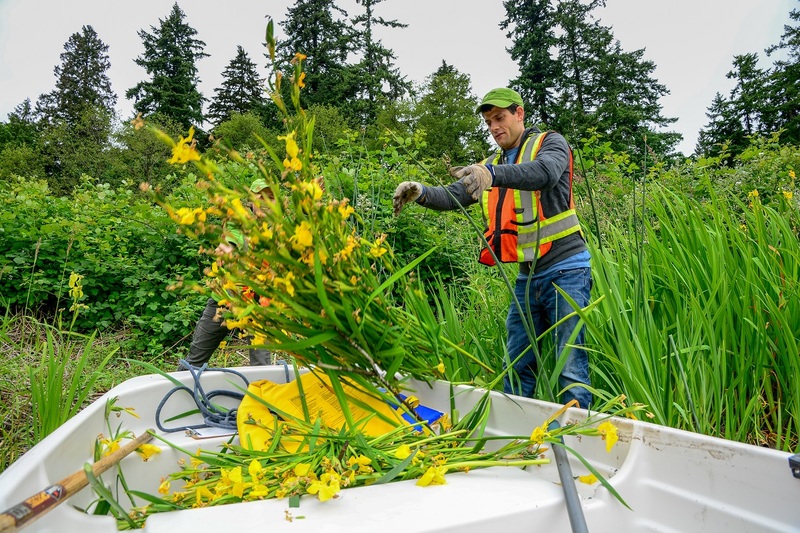 Together we are winning the battle against invasive plant species in Stanley Park!